Linda Biek, NASBA’s Director of Governmental, International and Professional Relations, has resigned her post to become the Hong Kong Institute of CPAs’ Director – Compliance. HKICPA is the sole statutory licensing body for auditors of public companies in Hong Kong. Ms. Biek has served as staff liaison for many NASBA committees and projects, including the Global Strategies Committee, Enforcement Resource Committee and Executive Directors Committee. She was previously the Executive Director of the Tennessee State Board of Accountancy. 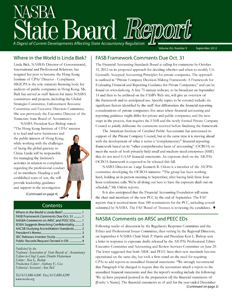 Linda has developed NASBA’s international presence through her efforts with the Global Strategies Committee and her development of NASBA’s Forum for International Accounting Regulators, which this year will be held in Orlando, FL, in conjunction with the Annual Meeting (October 31- November 1). Stepping in for Linda, NASBA Vice President Daniel Dustin will lead staff support for the upcoming Forum.